A Premium Quality Low Sheen, 100% Scrubbable, Acrylic High Opacity Architectural Paint. 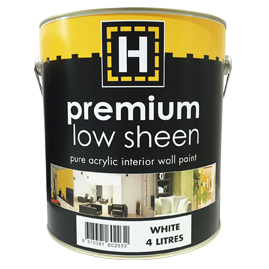 H-brand premium low sheen is a premium quality, 100% scrubbable, acrylic architectural paint which dries to a smooth, low sheen finish on appropriate and properly prepared interior surfaces. Special micronised pigments are used to achieve a smoother and stain resistant surface. Ideally suited for walls and ceilings in laundries, bathrooms, children's rooms, garages, etc. It may be used in food preparation areas, eg. bakeries, confectionery buildings, kitchens etc. It is not recommended for use on door or window trims, H-brand gloss or satin trim is best suited for these areas.